Last week, Torque Brewing’s canned beer made their very first appearance in Brandon! Torque’s not distributing to Westman yet but they are hoping to be available on tap and in cans throughout Westman ASAP (meaning next year, maybe). Instead, an awesome MLLC rep brought several dozen Torque beers to Brandon to be sold at the 10th & Victoria Liquor Mart to give local beer geeks another sample of the brewery’s beer for those who missed out on the partial tap takeover a few weeks back! Torque’s Witty Belgian witbier, Witching Hour Dark Pumpkin Ale and Diesel Fitter American Stout all made it to Brandon. Witching Hour is already out of stock and Diesel Fitter and Witty Belgian are the only remaining beers at the 10th & Victoria Liquor Mart until Torque starts distributing to Brandon in the near future, which hopefully is sooner rather than later. 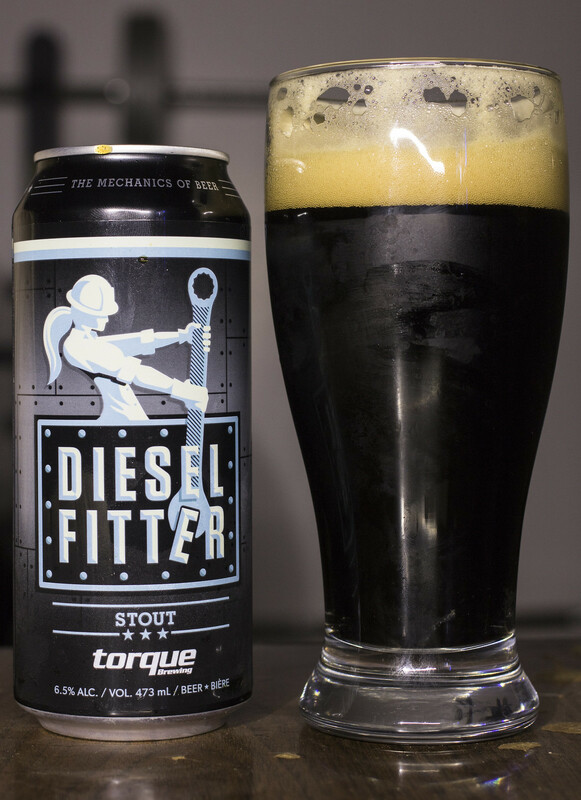 The days are getting shorter and colder so it’s the perfect time to review Torque’s Diesel Fitter American Stout. The stout tops out at a modest 6.5% ABV and a surprising 65 IBU which makes it more bitter than many India Pale Ales out there. The stout pours a rich, dark as night black stout that’s heavy and with a nice full cookie dough beige head that just screams “winter is coming!! !” The aroma is roasted malt forward giving off notes of coffee, chocolate/cocoa powder, vanilla and a surprisingly liberal amount of earthy hops. The flavour profile starts off with a rich roasted maltiness that, like the aroma gives off a good coffee and chocolate flavour to it, just like a mocha - rich and creamy. There’s a great deal of earthy hops popping up giving off a taste that I can only describe as what reminds me of “dead grass and leaves right before the first snowfall of the year”.. yeah, it sounds weird but it just has a flavour profile that forces you to accept that winter will be here in a few weeks. The stout is quite a bit more bitter than your typical stout.